Cartoon animals and drawing go hand in hand. Think about this for a second, how many cartoon movies, have you seen that didn't have any animals in them? What I'm trying to say here is that people love animals, especially when they're cartoons! I know I love them, don't you? So, if we can agree that everyone loves them then I'm sure your next question must be: "How can I learn to draw cartoon animals?" That's a fantastic question and I'm glad that you asked it. Let me tell you how you can get started. Look below and you'll see several step-by-step lessons that can help get you started. Each month we'll add more tutorials to this page. If you're really interested, sign up for the Drawing Coach news letter to the right and I'll make sure that each month you're kept up to date what new drawing lessons and tutorials have been added to the site. In each lesson you'll learn to use simple shape to begin, and progress through each stage of the drawing until you have a finished piece truly worthy of hanging on your fridge or on your wall! If you don't find the cartoon animals you're looking for, go to the Contact Us section of the site to suggest a tutorial that you would like to see on the site. Woof, woof! It's time to play fetch with those pencils as we learn how to draw a cartoon dog! Man's best friend has been a source of inspiration for countless cartoon characters such as Snoopy from Peanuts, canine sleuth Scooby Doo, Disney's Goofy and Pluto and Brian, one of the most intelligent members of the Griffin family in Seth MacFarlane's Family Guy. So, let's get started! Quack quack! It's time to make a splash by learning how to draw an awesome duck cartoon! These comical creatures have been the inspiration for numerous cartoon characters, including Walt Disney's Donald Duck and Warner Bros' Daffy Duck. So, follow our simple steps and you'll soon be spreading your wings and following in their famous webbed footsteps! Stand tall! It's time to learn how to draw a cartoon giraffe – the tallest animal in the land! This awesome creature is native to Africa and instantly recognizable thanks to her long neck and distinctive markings. So, let's rise above the rest and get our pencils at the ready as you add another amazing animal to your portfolio! It's time to beat your chest and grab a bunch of bananas as you learn how to draw a cartoon gorilla! There's no time for monkey business, especially as a gorilla isn't a monkey at all – this mean-looking dude belongs the family of primates known as apes. So, grab your pencils, come out of the mist and let's get sketching! G'day mate! In this lesson, we're going to come down from the trees and travel over to Australia to learn how to draw a koala. These incredible creatures are native to the island and have captivated people for years with their cute appearance and amusing habits. So, let's grab a eucalyptus leaf and some pencils and get ready to do down under!! It's time to spread your wings and get creative by learning how to draw a cartoon hawk! This awesome aviator is one of the most well-known birds of prey and now, you can be flying high when you follow our simple steps and create an epic illustration of this amazing creature.! Roll up, roll up! In this lesson, we're going to learn how to draw a cute cartoon hedgehog – a small, spiny mammal that's native to Europe, Asia, Africa and New Zealand. So, don't be shy – get your pencils at the ready and follow these simple steps to drawing our prickly friend! Mud, mud, glorious mud! In this lesson, we're going to take the plunge and learn how to draw a hippo cartoon that will really create a splash with your family and friends. So, let's pick up our pencils and get started on our awesome illustration! G'day! In this lesson, we're going to take a trip to Australia as we learn how to draw a cartoon kangaroo – it's easy once you've followed our simple steps. So, let's hop to it, pick up our pencils and get started! Giddy up, pardner! In today's lesson, we're going to learn how to draw a cartoon horse. Once you've followed our easy steps, you'll be galloping along in no time and impressing friends and family with your amazing artistic skills. So, saddle up, grab your pencils and let's get going! Hop on in, the water's fine! Learning how to draw a cartoon frog is as easy as sitting on a lily pad once you've followed these simple steps. So, let's jump to it and get started on another awesome illustration that will make your friends and family green with envy! Stay ahead of the pack by learning how to draw an awesome cartoon wolf! Once you’ve followed our easy steps, your friends and family will be howling in appreciation at your amazing artistic ability. So, grab those pencils and let’s get started – you’d be barking mad to miss this! Get busy like a beaver and learn how to draw one of these cute critters with our easy-to-follow steps. Learning how to draw a cartoon beaver couldn't be simpler, so grab your pencils and follow us down to the river bank where we'll get better acquainted with our furry friend!! Quick, blink and you’ll miss this awesome athlete! With incredible markings and super-fast speeds, the cheetah is easy to spot (geddit?) – it’s keeping up that’s the problem! However, once you’ve followed our simple steps, you’ll be up and running after you’ve learned how to draw a cartoon cheetah the easy way! Why not hatch a plan to learn how to draw a cartoon chick? It's easy ifyou follow our step-by-step guide and you'll soon be flapping your wings as you impress friends and family with your cracking creative skills! Get ready for some armor action! Don't roll yourself up into a ball like this little dude – simply follow our step-by-step guide to learning how to draw a cartoon armadillo. You'll soon be wowing friends and family with your supreme skills with a pencil! 'Feline' creative? Show off your artistic prowess with this purr-fect drawing of a cat. You'll be the cream of the crop once you've followed our simple step-by-step guide on how to draw a cartoon cat, so get some pencils in your paws and let's get started! Don’t get grizzly! Impress your family and friends with your supreme sketching skills when you follow our simple steps and learn how to draw a cartoon brown bear. Put a pencil in your paw and let’s get started! Don’t be scared! Despite his sharp fangs and blood red color, this awesome bat is, in fact, a friendly little mammal with all kinds of amazing skills. Learning how to draw a cartoon bat needn’t take you until twilight either – simply follow our simple steps and you’ll be flying in no time! You don’t have to be as old or as wise as our buddy here to learn how to draw a cartoon turtle. Simply follow our easy steps and you’ll soon be coming out of your shell and impressing your friends! Charm your friends and family by learning how to draw a cartoon snake – it’s not slippery at all if you follow our simple steps! Your friends and family will go nuts for your awesome illustration of this cute squirrel! And, learning how to draw a cartoon squirrel is nowhere near as tricky as you might think – just follow our simple steps and you’ll soon be wowing people with your creative skills! Learning how to draw a cartoon skunk needn’t be as unpleasant as this furry friend’s smell! Simply follow our simple instructions and soon, you’ll be impressing friends and family with your awesome drawing skills! You can really bring home the bacon by learning how to draw a cartoon pig. Follow our simple steps and you’ll soon be impressing friends and family with your awesome sketching skills! Be the envy of all your friends by learning how to draw this rad raccoon. Follow our simple steps and you’ll soon be earning your stripes! Did you love Happy Feet? Well, creating a perfect penguin couldn’t be easier with our four easy steps..
Take to the ice and get your pencil at the ready to draw this cute polar bear! It’s easy when you follow our four simple paw prints. Do you want to learn how to draw a cartoon alligator? It's easy. Jump in, the water’s lovely and warm! This grinning gator is a fine example of the species known as crocodilians, or ‘crocs’ for short. Is he the king of the swingers or just a very cheeky monkey? Either way, this prancin’ primate is sure to turn heads in the jungle with his streetdance prowess and finesse. In this lesson you will learn how to draw a lamb holding a handbag. No special skills necessary - just the willingness to draw and have fun! Learn how to draw a rhinoceros by combining very simple shapes and lines together into an amazingly cute result! Your safari drawings will never be the same once you learn how to make this cartoon rhino. Learn how to draw this quirky cartoon dragonfly by combining very simple shapes and lines together into a rather pleasing design if I do say so myself! This cartoon penguin is really cute. Why not give it a shot and learn how to draw him right now? You've got nothing to lose, so give this penguin cartoon drawing lesson a chance. It's no secret that monkeys are curious and funny cartoon animals. Learn to create your own monkey cartoon when you follow the step by step guide right here. Oink, Oink! This little guy is so fat that it's hard to believe that he could even stand up on those tiny little legs. Grab your lead and give this drawing lesson about how to draw cartoon pigs a whirl! This funny little guy is super easy to draw, so you will have lots of fun learning how to draw your very own cartoon elephants. Learn how to draw this goofy little cartoon donkey by combining some circles and some lines into a very simple and wonderful design of a donkey. Learn how to draw this cute little cartoon bat by combining vary basic shapes together into a very pleasing result. Learn how to draw a cartoon panda when you follow along with the steps in this lesson. This guy is big and friendly and you'll surely imporess your friends and family with your drawing of him. Grab your pencil, eraser and some pencil crayons as you dive in and learn how to draw a Koala Bear in just six simple steps. Yet another drawing you can add to your list of cartoon animals you know how to draw. If you've been to the sea park at the zoo you’ve most certainly seen one of these curious creatures. Now it's time to draw your very own cartoon manatee. It's time to learn how to draw a mommy duck and her two little ducklings. Follow along and create your own cool cartoon animals drawing. Learn how to draw this funny looking cartoon cow by combining simple shapes together into a very pleasing design. It's time to get your MOOO on and create this cuddly creature. Start building your own farm and learn how to draw cartoon chickens. When it comes to drawing cartoon animals the chicken is one of the cartoon animals that you should really know how to draw. Follow along and let this cute, cuddly cartoon bear come to life on your own page. No special skills or tools required for this one. Just click on the link and get started! You'll need to draw quickly to capture this cute cartoon bunny before she jumps right off the page. Follow the simple guide and learn how to make another cartoon rabbit. It's time to bust out the ole pencil again and have a crack at creating your very own cartoon wolf - don't worry though, he won't bite! Beak...Check, Wings...Check, Webbed Feet...Check. Looks like all the ingredients you need to learn how to draw your very own cartoon ducks. Here's another dragon drawing lesson for you to use and create your own cute flying dragons. Why not take a chance at learning how to draw mytical cartoon animals! Follow along and learn how to draw a very cute cartoon cat. This furry little guy might remind you of some famous cats you have seen on TV or in the movies. If you can draw circles and ovals you will have no problem learning the secret behind drawing this cartoon rabbit. Follow along and learn how simple shapes can give you everything you need to create this character. Once again use just simple shapes to create another great looking cartoon animal. Circles, curves and lines will have you creating the cute cartoon duck in absolutely no time! Follow the steps one by one and learn how to draw your new best friend - a cartoon dog! Though he looks simple, this dog is a little more challenging than most of the other lessons on this page, but don't be afraid to give it a shot! As you follow along with the step by step drawing lesson you'll quickly realize that drawing cartoon horses isn't as hard as you may have thought it would be. Learn all you need to know in just four easy to follow steps. Work through the steps as you learn how to draw this funky looking cartoon chicken. Combine basic shapes to create a cute and stylized cartoon drawing. This friendly cartoon dog is just waiting for you to pick up your pencil and create him right before your eyes. This lesson is an example from the Workshop Above. This pig drawing lesson is the perfect place for you to start if you're just getting back into drawing. Not only is he easy to draw, he's also as cute as can be. Learn how to draw this stylish cat in just four easy to follow steps. This lesson is an example from the Workshop Above. This big clumsy elephant wouldn't hurt a fly! Start with simple shapes and work your way toward the finished drawing. This tiger has seen it all and he's looking a little bit bored at the moment. Follow the lesson and create your own tiger drawing. This easy step by step lesson will teach you how to draw a cartoon lion.This lesson is an example from the Workshop Above. Drawing Dogs - Easy - VIDEO LESSON! Learn how to draw a simple cat. 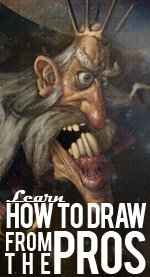 If you're new to drawing, this would be a great lesson to start with. I promise you it will be completely painless! Look after your cheese if you decide to bring this cartoon mouse to life. If you're not careful he just might steal from you! Larry the lazy-eyed cartoon bee is just waiting for you to open this step by step drawing lesson and bring him to life because he's hungry for flowers and needs a little help finding them. Cartoon Animals don't get much easier than this lesson on how to draw cartoon frogs. Use this as one a starting point for beginners. Cute, friendly and just waiting for you to learn how to draw him. Dive in and learn how to draw a cartoon turtle. This step by step lesson is so easy, and the penguin you will make while doing it looks great. That's a win-win situation in my book! Go ahead and click the penguin to find out more. In this lesson you'll learn how to draw a dragon in the same style that you often see on television cartoons these days. Soft and cute panda drawing is what you'll learn when you click this lesson. The shapes are deliberately simple and this would make an excellent first lesson for those of you who are new to cartoon drawing. Learn how to draw a cute sheep in this step by step cartoon drawing tutorial. This guide will show you a method of building a sheep body that can be used again and again to create many different poses and positions. All you need is your imagination and this guide will show you the rest. Monkeys are one of my favorite cartoon subjects! This guide will show you how to draw a cartoon monkey head in a snap! Learn how to quickly and easily draw two great looking and unique kinds of cartoon fish.